Click the questions below to reveal the answers! Regular students, both US citizens and eligible non-citizens can qualify for financial aid. The application will notify you if you don't meet the basic criteria to apply. The FAFSA is just the first step in the process to find out if you are eligible to receive financial aid at UCC. Apply as early as possible with a new FAFSA for each school year. October 1st is always the first day to apply for the next school year. The entire process can take several months depending on the time of year. Apply by our recommended application deadline to make sure you have enough time to complete the process before the term you want to attend. Watch a video on How to create an FSA ID. I Live On My Own &/Or Support Myself. Do I Still Need My Parents Tax Information? If you answer no to all questions on the Dependency Determination section of the FAFSA, you must include parent information. If your parents do not provide their information on your application, you cannot be considered for aid. If you have special circumstances and can provide documentation that something occurred that severed the relationship with your parent(s), and you can provide documentation that you have no contact with your parent(s), contact the Financial Aid Office. I Filled Out My FAFSA & Received An Email That It Is Confirmed. Why Haven't I Received My Award? Filling out a FAFSA is the first step in applying for financial aid and not the only step in the Financial Aid Process. When a FAFSA is received by the Financial Aid Office an email is sent to the email address the student provided to the Admissions Office. The email serves as notification to students that their FAFSA has been received and provides instructions for next steps. UCC has also put together our Financial Aid Process. How Will I Know That I've Been Awarded & The Amount? UCC Financial Aid sends an electronically generated Award Notification to your UCC provided Student Email. It is important for students to read their Award Notification carefully and be mindful of time limits imposed for accepting their aid. Students can also check for a financial aid award in their student self service. Sign in then click 'Financial Aid', 'Award', Award for Aid Year', select the appropriate aid year and then submit, and click the tab titled 'Accept Award Offer'. Did you receive a blank Award Notification? A blank award letter is provided when a student’s Expected Family Contribution (EFC) is higher than allowable to receive a Pell Grant and/or Subsidized Loan. These students may be eligible to apply for an Unsubsidized Loan. Award Letters provide loan information and links to the loan application. When Will I Receive My Financial Aid Check? The Finance Office will process refunds (either by check or direct deposit) beginning the second Friday of each term with the exception of Summer, which will occur on Thursdays. Further disbursements will take place weekly throughout the term for those who may have turned in documents after the deadline. The Finance Office provides two options for students receiving a financial aid refund. Students may elect to have direct deposit or a check mailed to their address. Questions regarding refunds or direct deposit should be directed to the UCC Finance Office. I did not receive my loan funds and/or my check was not as large as I expected. Why? I did not receive a refund, why? For what reasons would my financial aid eligibility be suspended? Students are encouraged to regularly check their eligibility status in Student Self-Service, especially after term grades have been posted. My financial aid is suspended, what are my options? Students may appeal to have their financial aid reinstated. Students must read the Satisfactory Academic Progress Policy and print out the Financial Aid Appeal form . There is a checklist on the last page of the appeal form indicating required documents for submitting an appeal. Advising referrals are issued by the Financial Aid Office. I have completed my Academic Appeal and it was approved. Why is my financial aid still suspended? Academic Appeals and Financial Aid Appeals are two separate appeal processes. During non-attendance a student’s eligibility to receive financial aid does not change. If a student leaves on financial aid suspension they return on suspension and must appeal to have their aid reinstated. I have submitted an appeal, how long does it take to know if my financial aid is reinstated? We make every effort to keep the wait time to a minimum. However, no two appeals are alike therefore no specific turn-around-time can be stated. A lot depends on timing and if the student provides all the documentation required for a professional judgment to be made. Students that check their eligibility status and learn their aid is suspended are encouraged to begin the appeal process as soon as possible within the term they are attending classes. Students are required to visit the Financial Aid Office to obtain a referral form to meet with Advising. How do I know if my appeal has been approved? Students that have submitted an appeal can expect to receive a letter of determination that clearly states the results, terms and conditions, and options if denied and an email sent to a student’s Student email account. Students may also monitor their eligibility status within their Student Self-Service in anticipation of a letter and email to follow. My eligibility status changed from “Plan” to “Good”, what does this mean? "Good" indicates that the student is back in compliance with the Satisfactory Academic Progress Policy. It is highly recommend that students continue to follow the mandatory term-by-term plan through to completion. How does adding a class impact my financial aid? Students may add or drop classes the first week of the term without financial obligation. Students registering for classes after the first week of the term and expecting their Financial Aid to cover the cost should consult the Financial Aid Office before visiting Registration. I am considering dropping a class/all my classes; how will it impact my financial aid? Different circumstances may cause a student to withdraw from a class or classes for a term. How much of an impact this decision will make to a student’s eligibility depends on whether these circumstances are outside of the student’s control. Dropping or failing a class impacts a student’s PACE completion rate and/or their Grade Point Average (GPA). Pace and GPA are used to determine a student’s eligibility to receive financial aid. Students that receive all F’s or withdraw (drops) from all of their classes will result in an automatic suspension of eligibility. Students must appeal to receive a reinstatement of financial aid eligibility, regardless of when the suspension occurred. A student that withdraws from one class may also risk losing their eligibility based upon their cumulative completion rate and GPA. More detailed information may be found by reviewing the Satisfactory Academic Progress Policy. Can I rely on an instructor to drop me from their class for non-attendance? Instructors may or may not drop a student for non-attendance or failing to log in to an online class. Ultimately, it is the student’s responsibility to ensure that a class has been dropped they no longer plan to attend. Students should contact Registration or log in to their Banner account and check Active Registration. How do I use the IRS DATA RETREIVAL TOOL (IRS DRT) IN FAFSA? It is recommended that whenever possible to use the IRS DRT available in FAFSA. There are situations in which using the IRS DRT is not available or using the DRT was not successful. Students may elect to order a Tax Return Transcript online or by phone. Students may also visit the IRS Tax Office in Eugene or Medford, Oregon to obtain a Tax Return Transcript. Hours: Monday-Friday 8:30 a.m. - 4:30 p.m. If a student used the IRS DRT in FAFSA and their Banner account indicates that a tax return transcript is a needed requirement, students should contact the Financial Aid office. 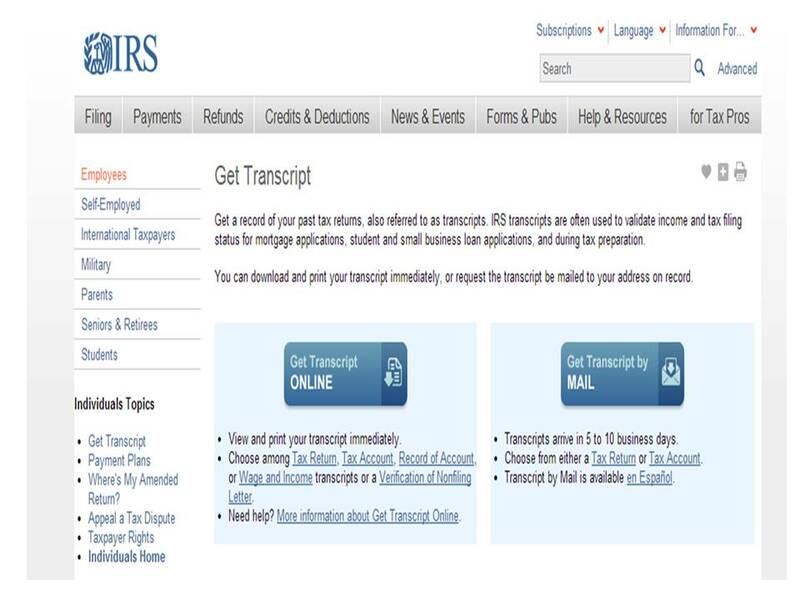 What is the cost to order a Tax Return Transcript from the IRS? Where can I obtain more information about financial aid and scholarships? Students are encouraged to read the Student Financial Aid Award Information Booklet and contact the Financial Aid Office if they have any questions.